Dilapidated and dangerous — Clearwater has a new plan to crack down on blighted homes by forcing negligent homeowners into the courtroom. 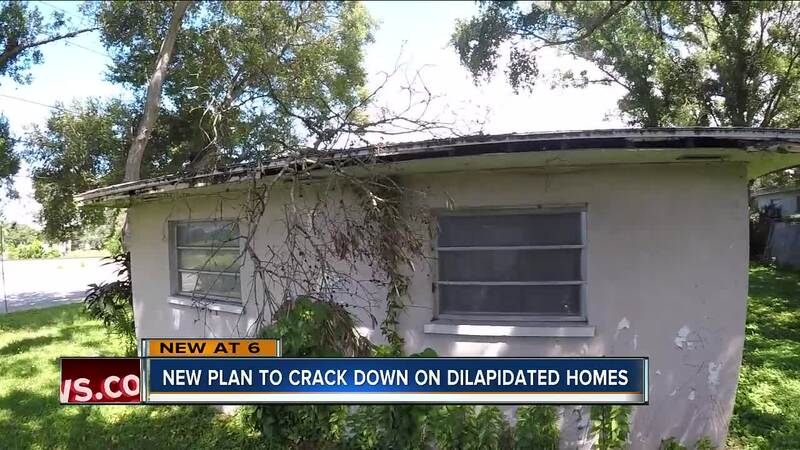 CLEARWATER, Fla. — Dilapidated and dangerous — Clearwater has a new plan to crack down on blighted homes by forcing negligent homeowners into the courtroom. Nearly 150 homes in Clearwater are on the city’s radar. The homes have stacked up a combined $18.6 million in code enforcement liens. Many are in severe disrepair facing issues like mold, vermin, termites, and squatters. Charles Mosley lives down the street from another vacant, rotting home at 900 Palmetto Street in Clearwater. “The neighborhood would look a lot better if they fix it up! I've lived here 8 years and in the time I've been here nothing has changed except for the homeless people coming in and out,” Mosley said with a sigh. Both men feel like they've run out of options in dealing with the eyesores. “It’s very frustrating because you don’t know who to talk to,” Mesner said. Now, Clearwater leaders have filed paperwork to take the 7 worst offenders to court, including both homeowners near Mesmer and Mosley. Terry Teunis, in Clearwater's Code Compliance Department, says it's the city's last resort. If homeowners don't fix up their properties or pay the fines owed, they'll face losing them. “The way I look at it is the owner has received many legal notices and has been non-responsive. I don’t know that we would ever get the owner’s attention unless we did something like this," Teunis explained, adding that since the 7 notices went out a few of the homeowners have contacted the city to find a resolution. “Oh good! Now it’s going to be handled," Mesmer said with a delighted chuckle when he learned about the city's action. One property at 1334 Fairmount St. alone has more than $900,000 in code enforcement fines. The seven properties whose owners have been served are located at: 900 Palmetto St., 1161 Marshall St., 115 N. Highland Ave., 1005 N. Highland Ave., 1334 Fairmont St., 1313 N. Martin Luther King Jr. Ave., and 1922 Overbrook Ave. The city expects to serve more homeowners at a future date. Clearwater's new program is modeled after a similar one in St. Petersburg where city leaders say they've had a lot of success and typically pursue about 20 properties per month. Any homes that have a homestead exemption would not qualify. "The old perspective was how does a government foreclose on it's citizens? I think we need to look at it from the perspective of all the citizens forced to live next to these properties for 10-15 years with limited or no response from the owners," Teunis added. Mesmer and Mosley are hopeful it will make a difference in their neighborhoods.